Rorik's Manor is the small home of Rorik, the head of Rorikstead and his best friend and companion Jouane Manette. 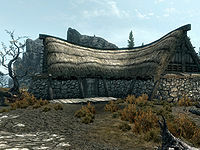 While the name suggests that it would be a grand house, Rorik's Manor is not much bigger than the other farmhouses in Rorikstead, which he owns. It is a single-story L-shaped building located at the northwestern end of the village. The only items of interest are a campfire with an empty pot hanging over it and an unowned bed roll beside it. There are two cows in an animal pen to the east of the house. The fireplace is opposite the entrance and has a cooking pot in front of it and three loose septims on the mantelpiece. The western end of the house is filled with several bales of straw, barrels and a large pile of firewood. To the right of the fireplace, against the north wall is a long wooden table and a kettle containing four potatoes. On the table are two more potatoes, a garlic bulb, a chicken's egg, several loaves of bread, a sliced eidar cheese, a cabbage and three seared slaughterfish. Above the table are two bunches of elves ear, a bunch of frost mirriam and two garlic braids. To the right of these is a rack hanging from the ceiling which holds two rabbits and two pheasants. To the right of the table is a flower basket containing four more chicken's eggs. Further along the north wall is a set of shelves holding two bottles of alto wine and three of wine. In the northeast corner is a dresser containing a selection of clothes, with a medium coin purse, a jug and two goblets on top. Beside this, coming out from the east wall is a single owned bed, where Jouane Manette sleeps. There is an end table beside the bed and an unlocked chest containing minor loot beside that. A counter coming out from the east wall to the right of all this with several sacks and a barrel, all containing food around it. On the counter are several bottles of wine, alto wine and Nord mead along with several pieces of cheese. Under the counter is a copy of Spirit of the Daedra and an empty petty soul gem. There is a chair and lute behind the counter and a wardrobe further to the right of that. Coming out from the south wall is a large double bed that Rorik uses with an end table on either side. On the left-hand end table is a potion of haggling and beside it on the floor is a medium coin purse. The right-hand end table has four loose septims on top. To the right of the bed against the west wall are a couple of barrels with more bottles of wine and alto wine on them, while further right is a small round wooden table and two chairs. On this table is a couple of bottles of Nord mead. This page was last modified on 28 March 2017, at 05:06.